Wed., April 3, 2019 11:55 p.m. | Wednesday, April 3, 2019 11:55 p.m.
A memorial at the Zone 5 Police Station on Sunday, April 5, 2009, remembers the three officers they lost. Pittsburgh police officers Paul Sciullo, Stephen Mayhle, and Eric Kelly were shot and killed in Stanton Heights the day before. An armored Allegheny County Police vehicle drives towards during the standoff at 1016 Fairfield Street on April 4, 2009, as dozens of other local and state police officers stand at the ready to respond along Antoinette Street—the cross street to Fairfield Street in Stanton Heights where four officers were shot and three were killed answering a domestic call. A fifth officer was injured with a broken leg. An armored Allegheny County Police vehicle has two bullet holes in the windshields after the standoff at 1016 Fairfield Street in Stanton Heights on April 4, 2009, where four officers were shot and three were killed answering a domestic call. A fifth officer was injured with a broken leg. Bloody soaked garments lay on the ground in front of 1016 Fairfield Street where 4 officers were shot, three fatally, after responding to a domestic distubance call at the home in the normally quiet Stanton Heights neighborhood on April 4, 2009. Kathleen Gilkey, 47 of Stanton Heights (right) breaks down into tears while standing with Jenny Skrinjar, 54, of Lawrenceville holding memorial wreaths honoring the three slain Pittsburgh Police Officers, Officers Eric G. Kelly, Stephen J. Mayhle and Paul J. Sciullo II, after the grandmother of Richard Poplawski, Lennell Reid (background) chained herself to the front rail of her home, Friday, April 10, 2009, which was the scene of the shooting. Police made her take the chain off. "We’re just here to keep the focus on the officers," said Skrinjar. Pittsburgh and Pennsylvania State Police stand at the ready around the corner from 1016 Fairfield Street in Stanton Heights neighborhood of Pittsburgh, PA where four officers were shot, three fatally, on April 4, 2009. Officers in tactical gear wait outside 1016 Fairfield Street. Police responded to a domestic disturbance call at the home in Stanton Heights where four officers were shot, three fatally. On Sunday, April 5, 2009, investigators examine the scene on Fairfield Street in Stanton Heights where Pittsburgh Police Officers Stephen J. Mayhle, 29, Paul J. Sciullo III, 37, and Eric G. Kelly, 41, were killed. Investigators on Sunday, April 5, 2009, examine the scene of a shootout Saturday in which three police officers were killed when responding to an incident at the house in Stanton Heights. Stephen J. Mayhle, 29, and Paul J. Sciullo III, 37, both officers for fewer than two years, and Eric G. Kelly, 41, a 14-year veteran were killed. A police sniper on a roof directly across the street from 1016 Fairfield Street signals to other officers as tactical officers stand atop an armored vehicle in the shooter’s front yard in Stanton Heights where four officers were shot, three fatally, answering a domestic call on April 4, 2009. A fifth officer was injured with a broken leg. Convicted cop killer Richard Poplawski is led into the court of Judge Jeffry Manning at the Allegheny County Courthouse, Thursday, Feb. 16, 2017. The hearing will deal with Poplawskiճ legal options in the wake of an execution warrant being signed. Chris Shelton and Shawn Howering had never heard of Stanton Heights or the terrible events that happened there on April 4, 2009, when they moved to Pittsburgh from Baltimore in 2011. 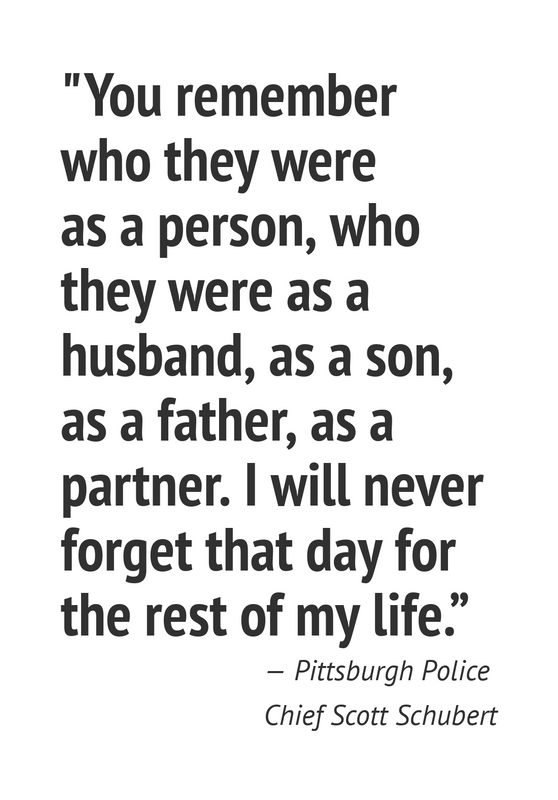 They had no idea when they started shopping for a house three years later that the one they picked included property where three Pittsburgh police officers died in a murderous ambush 10 years ago. The neighborhood seemed safe with lots of city police officers living there, and the house came with a big side yard at an affordable $132,000. Pittsburgh had condemned and demolished the neighboring house at 1016 Fairfield St. in 2011, two years after a 22-year-old man who had been arguing with his mother shot and killed city Officers Stephen Mayhle, Eric Kelly and Paul Sciullo there. A previous owner of the house that Shelton and Howering bought incorporated the vacant lot into the yard. “I hadn’t heard of it at all until the real estate agent disclosed that this was the property,” said Howering, 35. “It’s interesting talk at parties,” said Shelton, 31, adding questions usually come after they tell people they live in Stanton Heights. With a bay window shattered from gunfire, a police sniper waits at the ready on a roof directly across the street as tactical officers stand atop an armored vehicle in the shooter’s front yard on 1016 Fairfield Street in Stanton Heights where four officers were shot, three fatally, answering a domestic call on April 4, 2009. A fifth officer was injured with a broken leg. Neighbors, police officers and city officials who were there 10 years ago call it the worst day of their lives. Johann and Donald Devinney, who live directly across the street, remember hearing the first shots, three booms in succession. Johann at first thought it sounded like wind blowing over garbage cans. When they look across the street today, they can visualize the gunman standing there with rifle in hand, staring at them for a moment after he shot the officers. “It was terrible. No one should have to go through that,” Johann said. For Pittsburgh police Chief Scott Schubert, then a commander in charge of the city’s SWAT team, memories can flood back with the sound of fireworks or a visit to the Zone 5 police headquarters where the three officers were stationed. Mayhle and Sciullo were killed first after responding to the domestic call. Kelly, who lived in Stanton Heights, was on his way home from work and responded to a call for officers in trouble. Former Public Safety Director Mike Huss remembers the morning being bright and crisp with no clouds. He also remembers the gunfire. It went on for hours as city SWAT officers engaged the gunman in a firefight. Both Schubert and Huss remember an outpouring of support from Pittsburgh residents. A Pittsburgh police officer is reflected in a badge that sits at a memorial to Pittsburgh police officers Paul Sciullo, Stephen Mayhle and Eric Kelly who were gunned down in the line of duty two years ago on April 4, 2009. Mayor Bill Peduto, then a city councilman, remembers the aftermath, meeting with the families, the viewings, the funeral and raising money for a memorial to the three officers outside St. Maria Goretti church in Bloomfield. 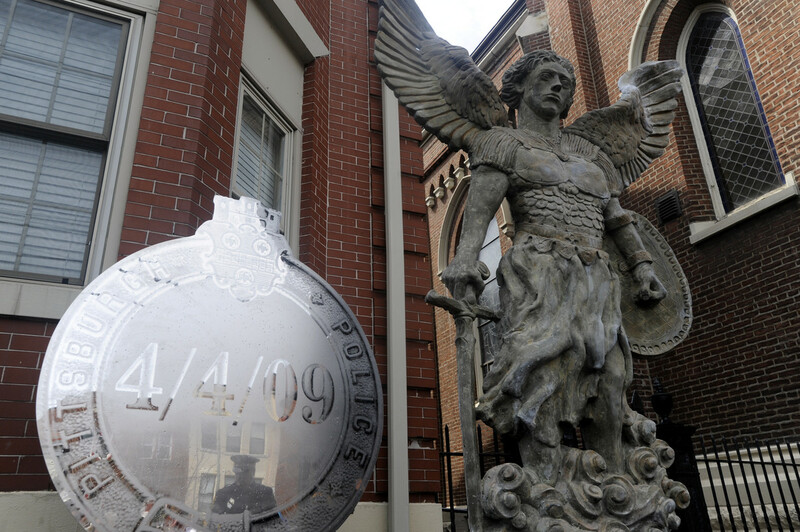 The monument, a sculpture of the Archangel Michael, the patron saint of police officers, still stands. “I’ve reached out to each of the families just to let them know that the people of Pittsburgh will always be there for them,” he said. The Devinneys said the neighborhood is quiet now. More than half of the homeowners who lived in their block 10 years ago have moved away. The curious no longer drive down the dead end street for a glimpse of the house. They were relieved when the city tore it down, saying it brought back bad memories every time they walked out their front door. People no longer ask them about the events like they once did, but the memories linger. The Devinneys recently had a new roof installed. The contractor found a spent bullet lodged in the roofing. 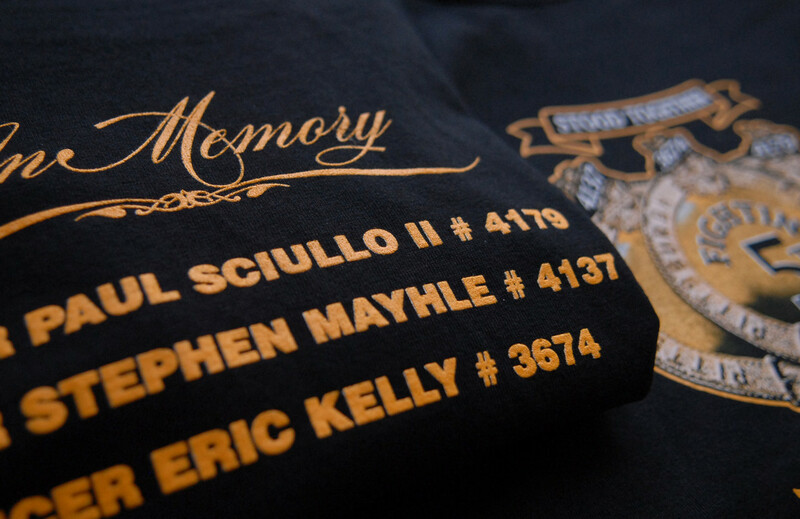 T-shirts made in memory of fallen Police Officers Eric Kelly, Stephen Mayhle and Paul Sciullo who were killed on April 4, 2009. On Thursday, Johann will don a memorial long-sleeved T-shirt produced 10 years ago in memory of the slain officers as she has every year since 2009. She’ll wear it to an exercise class in Morningside, and people will see it and remember, she said. Bob Bauder and Megan Guza are Tribune-Review staff writers. You can contact Bob at 412-765-2312, bbauder@tribweb.com or via Twitter @bobbauder. You can contact Megan at 412-380-8519, mguza@tribweb.com or via Twitter @meganguzaTrib.